Don't choose between security, compliance, and growth. With IdentityNow, the modern SaaS identity governance solution, you can tackle all three. Empower your employees while securing ALL of your digital identities as they access ALL applications and ALL data across your hybrid IT environment. See all your users, apps, and data so you can make the right security decisions. Answer the question “who has access to what” for your entire IT ecosystem. Simplify the user experience with an intuitive interface and business-friendly language. Reduce help desk calls, increase security, and enhance user experience. Administrators can quickly develop policies to reduce risk of fraud and maintain compliance. Organizations can quickly generate customized audit reports in minutes. With our Dynamic Discovery Engine, take action on identity related information in minutes. Enable users to request access to systems and applications through a streamlined and secure approval process. Increase awareness and efficiency throughout the business by providing users with a personalized view of all identity related tasks. 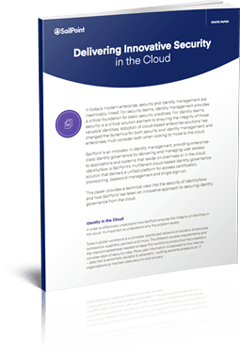 SailPoint customers can have confidence in the integrity, security and reliability of a SaaS identity governance experience. These two information security assessments evaluate development practices and the treatment of confidential information within IdentityNow. See the SailPoint difference. Create a comprehensive identity strategy. See how SecurityIQ offers identity governance for files. We’d love to talk about your identity challenges and show how SailPoint’s identity solutions can address them.